Here at the law office of McGrady & McGrady, L.L.P., in Hillsville, Virginia, we are fully prepared to help protect your rights and increase your chances of obtaining the favorable outcomes you seek for the serious and pressing legal issues you have involving personal injury claims and motor vehicle accidents, divorce and other family law issues, criminal defense, and traffic violations. 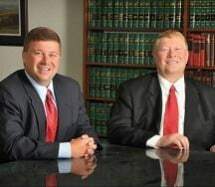 Serving clients throughout Carroll and Wythe counties and the surrounding areas, our attorneys, Joseph and Jonathan McGrady, possess more than 69 years of combined legal experience, and our family run law firm has served the members of our community since 1973. During that time, we have become the trusted source of quality counsel and effective advocacy for those across our area, and we are proud to be able to help so many during their most dire times of need. Our family hails from some of the earliest settlers of Carroll County, so we have a genuine concern for making our community as safe and welcoming as possible for everyone. As such, we deliver exceptional, personalized guidance and support, and we will work to build the strongest case on your behalf to help improve your chances of achieving the positive results you deserve so that you can secure a brighter future for yourself and your loved ones. To find out more about how we can best serve your needs, you can contact McGrady & McGrady, L.L.P., by calling our office or visiting our law firm's website to schedule a free initial consultation.